The 2019 U.S. Army Junior Rifle National Championships came to end on Saturday, 26 January. For three days, more than 150 of the top junior marksmen from across the US competed in three-position smallbore, sporter and precision air rifle matches. 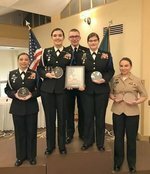 Volunteer NJROTC Rifle Team lead the way once again in the 2019 National Air Rifle Championships. This is a back to back win for Volunteer, having also won the National Championship in 2018. This is the 4th National Title for the Team, having won the Army National Air Rifle Championship in 2016, 2018, 2019 and the NRA National 60 Shot Standing Competition last summer in Bloomington, IL. In addition to the team championship, two of Volunteer's marksmen were also recognized for placing in the top 3 overall. Taking the podium for 2nd place overall was Team Captain Jaden-Ann Fraser with 1st Year Marksman Olivia Cattrell placing 3rd.